Aphids | Infonet Biovision Home. They are small (1 to 3mm in length), brown to black in colour, and may be winged (having 2 pair of wings) or wingless. They feed by sucking on new growth and blossoms. High numbers are found on the leaf surfaces during the period of flushing (production of new shoots) and stems of attacked young shoots die back. Attacked leaves are curled and distorted. Flower buds are damaged or drop. Aphids excrete large amounts of honeydew. Leaves and fruits may turn black due to the growth of sooty mould. Symptoms can be severe on flush growth during dry periods following rainy spells. Citrus aphids transmit tristeza and other virus diseases in citrus. 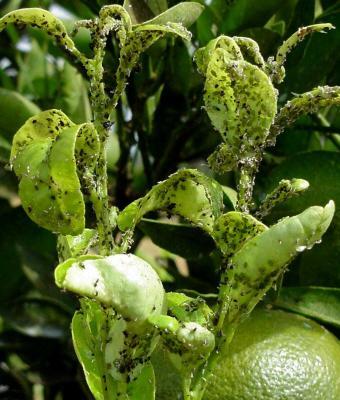 The black citrus aphid T. citridus is the most efficient vector of the citrus tristeza virus. Citrus aphids are frequently kept in check by natural enemies, especially ladybird beetles, lacewings, hoverflies and parasitic wasps. Aphids are likely to become less of a problem if their natural enemies are not destroyed by pesticides. Management of ants may increase the efficiency of these natural enemies. Insecticides should be applied only when heavy aphid populations are developing on the new flush. Only infested shoots should be treated, especial attention should be given to the lower leafsurface. Neem products are reported to give good control of this aphid. Good control has been reported by the application of a 2% Neem Seed Kernel Extract (NSKE) at the beginning of the infestation on lime to kept this aphid below the economic threshold level in the field in India. For more information on Neem click here (Jotti et al., 1990).